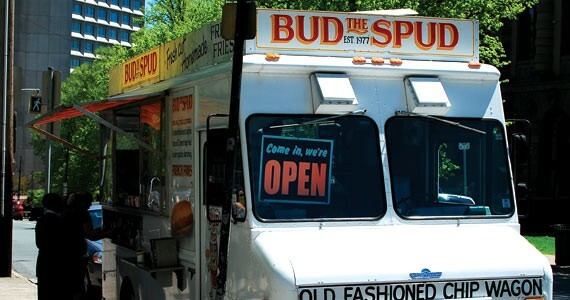 We survey old standby Bud the Spud, along with Halifax’s newer street food offerings. Let's face it: Halifax isn't exactly renowned for its street food. Vancouver's streets are lined with exciting fare such as tandoori burgers and gourmet duck salads, while New Yorkers can snag anything from street-side arepas to dosas. I hit the streets with some friends to sample the few items we do have. Not all our favourite vendors were out yet (the infamous Dawgfather, his $1 hamburgers and cornucopia of toppings were nowhere to be seen on a sunny Sunday), but after a long grease-induced coma, here's a roundup of our walking tour. The familiar scent of deep-fried goodness is my first indication that Bud the Spud has returned to its sought-after spot in front of the Halifax Public Library on Spring Garden Road. 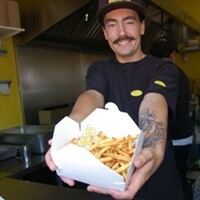 Just $3.50 nets us a generous heaping of golden hand-cut fries and friendly, laidback service. The fries are satisfyingly crispy on the outside and tender on the inside, just like I remember. We head over to Andrew's Fish and Chips, the neighbouring truck to Bud the Spud. An attentive, chatty vendor tells us that the haddock fillets are way bigger than usual. We order a one piece fish and chips ($6), which is as large as your typical two-piece fish and chips. The fillet is about an inch thick, tastes satisfyingly fresh and flakes apart nicely. We dunk it in packaged tartar sauce, which we wish was homemade. The fries are fresh and don't lose their crispness when doused in vinegar. But a thick shell of overly crispy batter slides right off the fish, making it tough to get any bites of batter and fish together. We head down to Queen's Wharf on the waterfront and order a Maritime Poutine ($5.99) from the The Battered Fish. Maybe it's the hungover gluttons in us, but it looks disappointingly small. We watch as a vendor pours cheese curds from a small plastic package onto the fries. The curds could be fresher and there aren't enough of them. Skinny, crispy fries come doused in flavourful real-beef gravy, which is plentiful but on the thin side. We try again, deciding on a coconut shrimp salad ($8.99). The four cocktail-sized shrimp are tender, coated with a coconut batter that doesn't disappoint. Roasted red peppers are a nice addition and the spinach, carrots and tomatoes are fresh. We toss the homemade pomegranate dressing, though, as it tastes overly sour and has the unexpected consistency of plum sauce. For a salad that's nearly $10, the portion is way too small. We notice the nearby BeaverTails bear closer resemblance to squirrel tails in size and make a mental note to avoid buying street food on the tourist-filled waterfront when we're feeling tight-fisted. On another evening, some friends and I line up at Rocky's Filipino Barbeque (5237 Blowers Street) to coat our stomachs after drinks downtown. Open from 10pm-5am, Rocky's marinated pork shish kabobs are grilled to perfection and never disappoint. The only thing that might rival them is a maple bacon cupcake---you heard me right ---from Susie's Shortbreads and Cupcakes. Follow @susieshalifax on Twitter to find out where you can stumble into Susie's bright pink cupcake mobile. The vanilla cupcake, stuffed with real maple syrup and bacon pieces and loaded with a thick dollop of maple buttercream icing and bacon "sprinkles," is a dream for potheads, pregnant women or the plain adventurous.